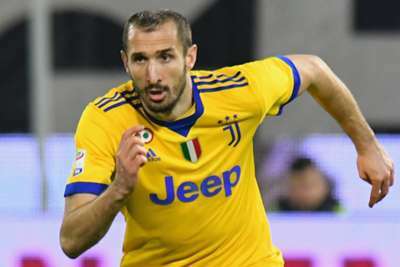 Juventus defender Giorgio Chiellini has backed the new 'Mind the Gap' campaign in a bid to inspire players to prepare for life after football. Chiellini has a bachelor's degree in economics and a master's in business administration but, according to FIFPro, only 13 per cent of active footballers in Europe have higher-education qualifications. The Italian is therefore supporting the campaign, led by FIFPro and the world football players' union, and co-funded by the European Union, to help players forge a second career. The campaign aims to guard against mental health problems and financial difficulties for footballers post-retirement. "As a footballer, at 20 years old, you feel indestructible and able to do anything in football," Chiellini said. "But at 35, your career is more or less finished. You then have the rest of your life in front of you and just being able to play football is not enough. Only a few players manage to find a job in football. Still taking his mother's advice all these years later. "There's also the risk of depression and there are many former players with financial problems because they have not thought about what they are going to do. They have not opened their minds by studying. "Each footballer has different tastes and they can choose which road they want to go down after football, but the important thing is to do something. "As a footballer, you need to start thinking about life after football at the beginning of your career, not at the end."